Hi everyone! 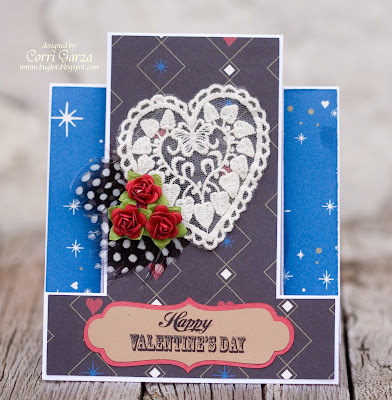 I have a pretty Valentine's Day card that I made with the Jinger Adams' Gypsy Queen collection and some of Jinger's fabulous embellishments. I used the Pop-Out Frame Card along with paper from the Gypsy Queen line. I know blue is not a traditional color for Valentine's Day but I think it looks unique and would be great for a guy. I added the vintage lace doily heart and embellished it with some of the black and white feather plumes. I had these little mulberry flowers in my stash and I love the pop of red. What a Beautiful card!Lovely color combo!